In my post on Berlin, I suggested that the British bombing of German civilians in the Second World War might be considered a crime. The most cited case of egregious bombing by the British occurred with the attack on Dresden on 13/14 February 1945, which caused a firestorm, mass death and the destruction of one of the most beautiful cities in Germany. People still argue over the rights and wrongs of that event, but either way it hangs over the city that we visited after Berlin, at Easter time this year. The Germans have done much to restore the city’s outward appearance. Most of the impetus came after German reunification. The Communists had a rather ambiguous attitude to restoration, destroying many historic sites to create a modern, socialist metropolis – though they did some restoration too. But what they build was mediocre. Now the classical facades have been replaced with modern imitations. Behind them are smart, modern shops and apartments; beneath them are underground car parks. And there are still whole blocks that are just holes in the ground. Some of the iconic older buildings have been restored inside and out to varying degrees. So we has the royal palace complex, and the Catholic Hofkirche, amongst others. Blackened stoneware from old buildings has not been cleaned, as in Berlin, to act as a reminder of the past. It is still recognisably the same city that was memorably painted by Canaletto’s nephew Bernardo Bellotto (who also used his uncle’s name). It has retained the open, spacious feeling, dominated by the Elbe river, of the old town, which acquired its character in Enlightenment times – it is not a modernised medieval city, like Prague (or London, come to that). So there is much to see and admire – much more than you think has survived or has been restored from what we generally assume from accounts of the bombing. What is more the collections of the Electors and Kings of Saxony had been moved to safety before the attack, and have mostly been returned (they were largely in Russian custody after the war – so this could not be assumed). So the museums are well stocked – with wonderful examples of old art, porcelain and scientific instruments, as well as some important modern works. The locals are friendlier than in Berlin, too, and museum officials less officious. With two full days we left much to see for another visit. Of course the bombing and reconstruction is a moving enough story in its own right. 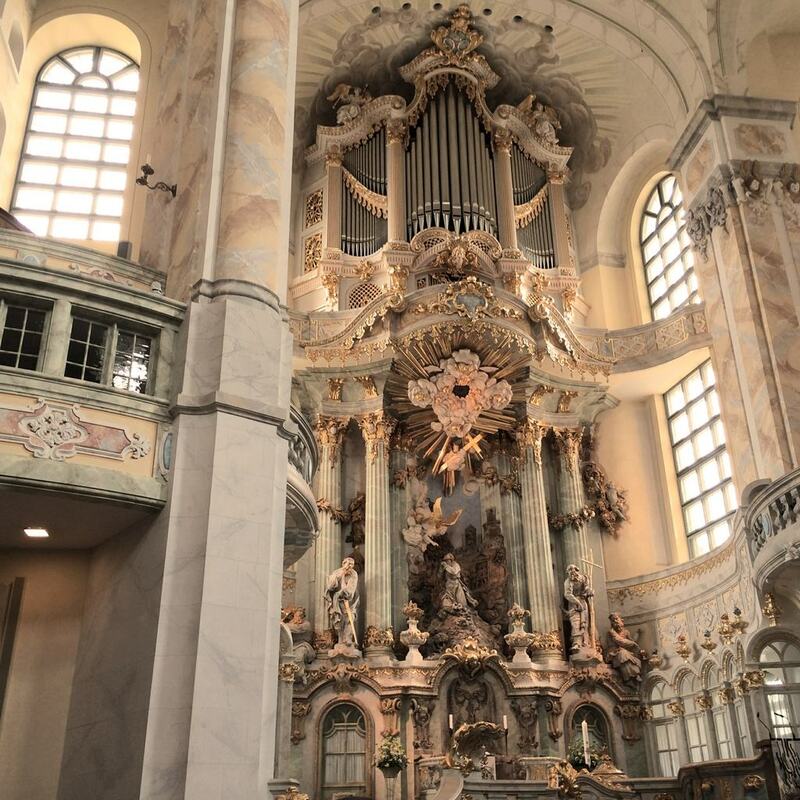 The most moving element of this is the story of the Frauenkirche. This magnificent edifice, the largest Lutheran church in Germany (and so the world?) was the city’s pride. It collapsed into a heap of rubble the day after the bombing, and was left as a pile of rubble until the 1990s. A massive restoration effort was completed in 2005, pretty much stone for stone. The old stones left blackened, the new ones are gleaming pale gold. The interior (pictured) is a wonder. Freshly painted and gleaming it perhaps gives a vision of what its 18th century creators intended – in a way that a building that had survived from that time would not. It is magnificent. As we Europeans come to terms with our history, at times creating magnificent monuments and works of art, at others engaging in wonton destruction, Dresden is a good place for us to reflect on who we are, and, I hope, for non-Europeans to learn from our achievements and our mistakes.